This week marks our first 6 months in Singapore. I am glad we have now gone through the initial phase of settling in, finding our basic bearings, and making our place more like home. (I hope to reveal some before and after snaps as I gradually work on the finishing touches so stay tuned!) But now, time to explore our newly adopted city and look for those hidden gems. The very second we walked into the lobby, we were welcomed by the glamorous, dramatic, nostalgic ambience straight from the roaring twenties: that exciting, jazzy, buzzing vibe; the super high ceiling with gold, pink, champagne tapestries and motifs; the grand, embellished brass staircases and balconies; the glossy finishes and gold details; the lavish leather and velvet seating; and of course, THAT 3-storey tall gin tower said to have housed over 1000 types of the spirit. Everywhere you look, the interior is immaculately staged and you can always find something that excites you: the lines, the curves, the textures, the motifs, the atmosphere. I felt like being in film set of The Great Gatsby and absorbing all that old Hollywood glamour. It is like Art Deco on steroid - a perfect setting for pure indulgence and I welcome this little escape from the every day Singapore. Apparently this location used to be a wine bar with waitresses dressed in silver fairy outfits (with wings no less) and they would 'fly' up the tower to fetch the wine you ordered. That sounds really tacky to me (sorry if you are a loyal fan!). Gin and champagne just seem more fitting to celebrate the grandeur and decadence of the bygone era. Our Gin Masterclass was hosted by the bar's Master of Gin, Jason Williams and Head Bartender, Roman Foltán. We started the evening with Gin Tonica, their in-house G&T, served in a generous goblet. It's mixed with London gin, house-made grapefruit tonic, and topped with a slice of grapefruit and juniper berries. It went down a treat and served as a delicious ice-breaker chatting to the fellow expats and gin tasters. For the actual tasting we were presented 4 different types of gin. First up was Fords, a full-body London-distilled gin with 9 botanicals (the one we had in the Gin Tonica) - I like the refreshing citrus and floral notes and it's the milder one in the session. Then we turned the heat up a bit and tried St. George Botanivore which comprises of 19 botanicals including cilantro, cinnamon, fennel seeds, Seville orange peel and star anise. It has got a spicy, complex flavour and you can really taste this party mix of botanicals. We then moved on to Monkey 47 hailed from the Black Forest region in Germany. And you've probably guessed it, it has a whopping of 47 botanicals AND an ABV of 47%! I have never tasted something like this - herbal, fruity, exotic, eccentric and mysterious. (Think I might have just found my new favourite...) And lastly we tasted Ransom Old Tom, a full-flavoured, smokey gin that gives a hint of malt whiskey. Very interesting and certainly not for the faint-hearted. The gin was served in these vintage style champagne glasses. 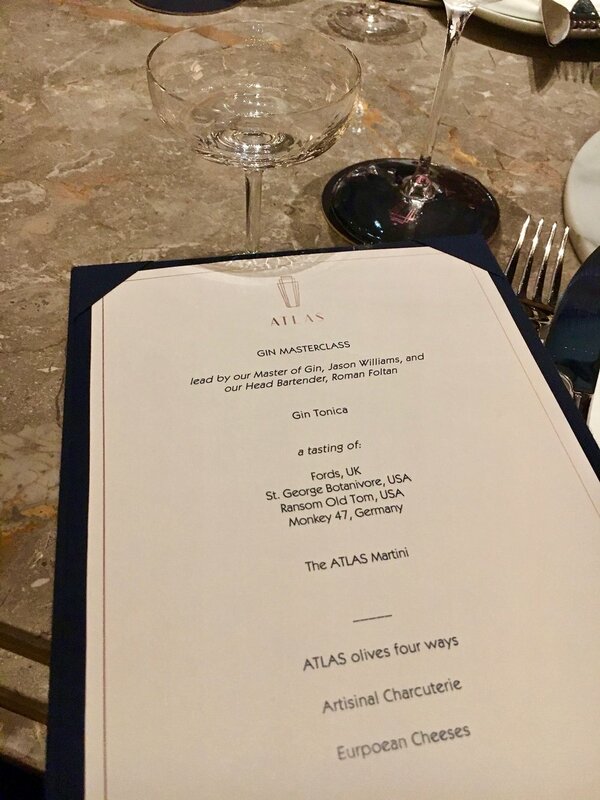 For the finale we were served a Gin Martini made up of gin, Ambrato vermouth, orange bitters, champagne vinegar and pomelo. Yum! A perfect finish for an evening packed with extravagant interior, splendid atmosphere, great drinks and fascinating conversations. 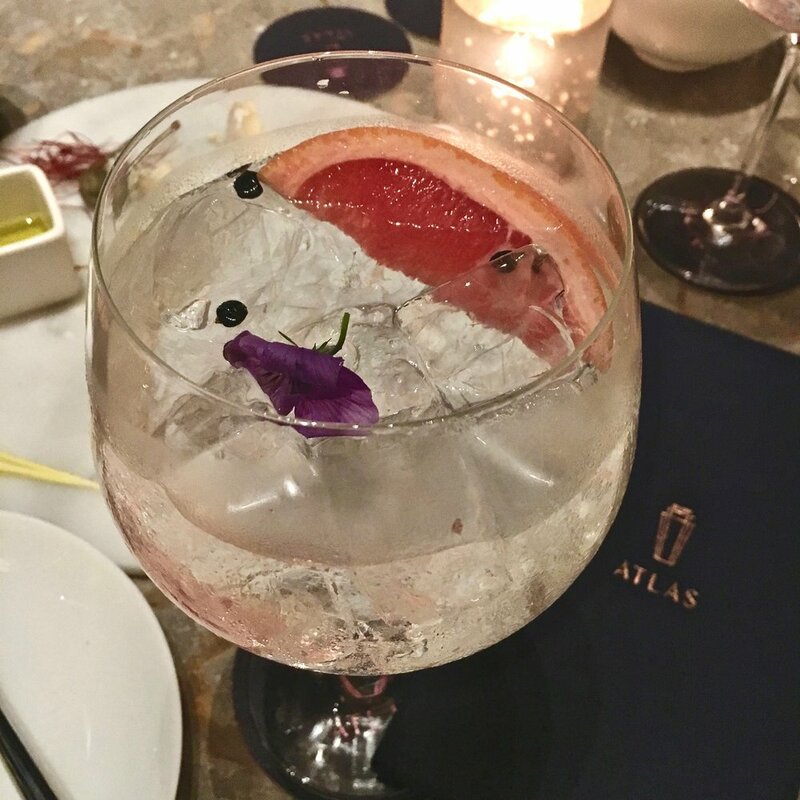 Have you been to Atlas Bar or other impressive gin bars? Leave a comment below and share your thoughts! Disclaimer: This is not a promotional post. All views are mine.